The day after Christmas is my favorite day of the year. Seriously. It’s calm. There’s a lingering glow from the month+ of holiday activities and months of prep. There’s no rush because we still have New Year’s to look forward to. It’s the perfect day to de-stress and stitch. And here’s a stitch for that spot you weren’t quite sure what to do with. It’s that “just right” stitch, if you will, as it falls precisely in between a small Alternating Cashmere and the larger version. The stitched sample uses Impressions and Neon Rays+ on 18-mesh. It’s an easy full coverage stitch with a zillion applications. This stitch, or either of its cousins, are great for backgrounds, baskets, floors, walls. I love the symmetry and elegance of it. For backgrounds on 18 mesh, I would use silk Perle, such as Elegance, for the gray lines and my favorite metallic such as Kreinik Metallics Tapestry Braid (#12) or Entice for the aqua lines. For a basket, I recommend an overdyed wool (Lorikeet or ThreadWorx), with a more subtle metallic such as Flair or Silk Lame. I love the smoothness of silk floss for walls. Pair it with a Neon Rays to enhance the smooth finish. Mix two matte threads for a rustic floor, such as Rainbow Linen and a Burmilana Tweed. Today’s stitch started in Baltimore and ended in Alabama. How does that work? The original stitch was a single column of 3X3 diamonds with a second diamond and a cross stitch embedded inside the diamond. It was for a accent area six rows wide on a chest of drawers on a Charley Harper Stitch Concept (from my embellishment event at Bedecked & Beadazzled). A few weeks later, I was working on the background for Flight School and I kept returning to this stitch. I wanted a slightly larger stitch so, to make it work, I added the Upright Cross Stitch in between the vertical columns. 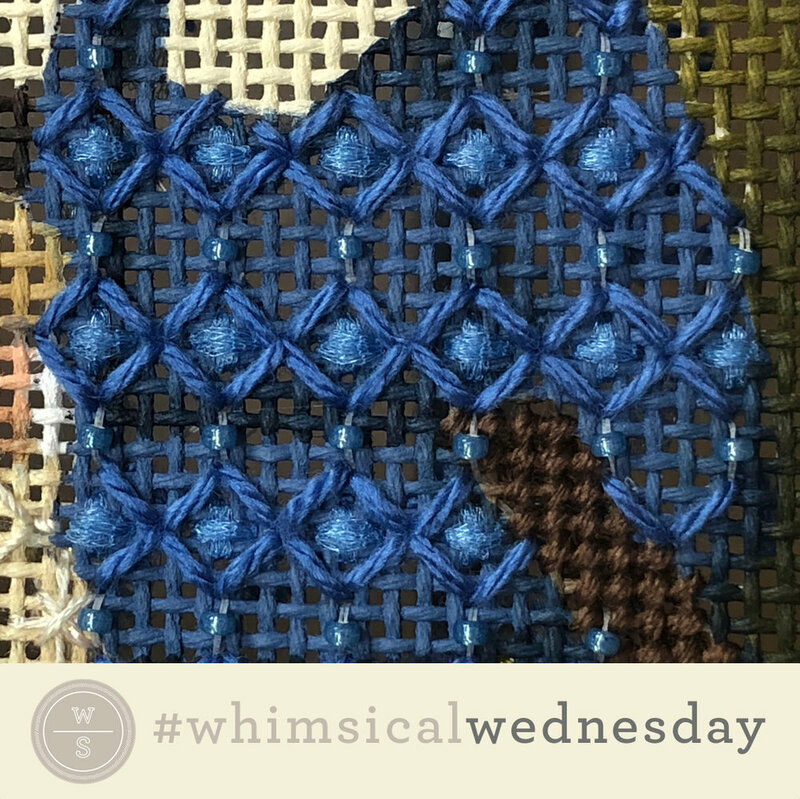 The stitched sample (from Flight School) uses Soie D’Alger (black lines), Petite Silk Lame (aqua lines), and Kreinik Metallics Tapestry Braid (#12) on 13-mesh. I would love to see this stitch for a floor (indoor or outdoor) with Rainbow Linen (black lines), ThreadWorx wool (aqua lines), and Neon Rays (gray lines). It would be a great stitch for clothing with Very Velvet (black lines ), Silk Lame (aqua lines), and Fyre Werks (gray lines). It would make a great roof with Silk Perle (black lines), such as Elegance or Treenway’s Tranquility, Petite Silk Lame (aqua lines), and Straw Silk for the Upright Crosses. 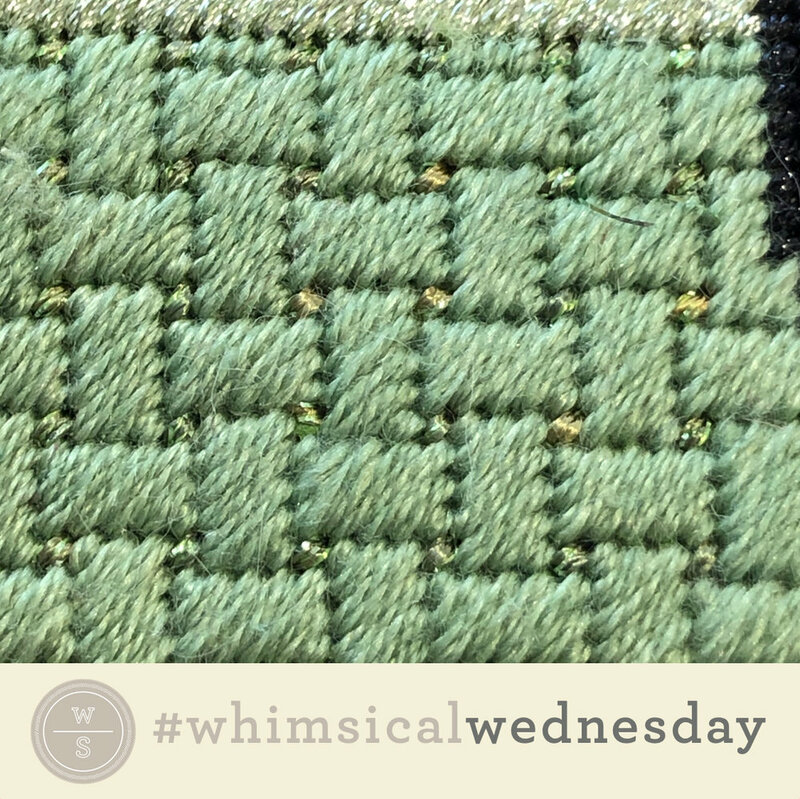 Today's stitch is a quick and easy full coverage stitch for a long, narrow space. The French Knots are a nice little surprise that add texture and a little extra something to what could be a boring area. The stitched sample is a Santa beard with three plies of Burmilana for the horizontal stitches (black lines) and two plies of the same Burmilana for the French Knots (gray circles). Typically, I add an extra ply of a thread when I am doing a straight stitch to make sure there is full coverage. It's easy and cute. I think it would be darling as cowboy pants with a lovely brown or blue variegated wool, such as Lorikeet or ThreadWorx Merino Wool. It would make a cute hillside or roof. Soie Cristale and beads (instead of French Knots) would make a gorgeous and elegant dress. Another variation would be to replace the French Knots with a Cross Stitch for a more subtle variation. hope you have the perfect spot for this stitch! Enjoy! Happy #smallspacesunday!